Life at Busy Solitude Farm: Who'da Thunk?! I went to the Wavelength Music Festival over the weekend. It was a full day's worth of all kinds of music, put on by the local low-power, all-volunteer radio station, Radio Harbor Country (check them out here). Only moments after I arrived, someone said "Johanna, look over there!" And look what I saw! Who'da thunk that would EVER happen??? Wow, how funny is that! I would buy one if they had a pony! Wow! 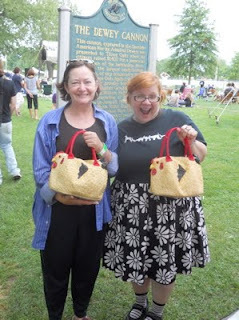 Chicken purses! too cute! When my mother first gave me the purse, I thought it would be a novelty. But it's become my regular, day-to-day bag and I really like it! I did check out Radio Harbor County and saw that the "Lunchtime Blues" show is on Wednesday mornings from 6 a.m. to 8 a.m. Just HOW early do people get up in Harbor County that they're ready for a sandwich at 6 a.m.?